Have you discovered a mold problem inside your home? Do you suffer from mold spore allergies and want an air purifier that can get rid of them quickly and easily? If you answered yes to either of those questions, then you’ve come to the right place. In this post, we’ll share with you some important information regarding mold and your health as well as what the best air purifier for mold spores is and how it can help get rid of it from your home. According to the Centers for Disease Control and Prevention, not everyone has a sensitivity to mold, but for those that do the common symptoms include a stuffy nose, irritated throat, coughing and wheezing. However, just because you don’t have an allergic reaction to mold doesn’t mean that it’s not causing harm to your health. In fact, being exposed to mold over a long period of time has caused many people to develop a strong allergy to it. In 2004 the Institute of Medicine discovered that exposure to indoor mold caused upper respiratory tract problems, coughing and wheezing in otherwise healthy people. Additionally, there have been other studies that suggest a link between early mold exposure and the development of asthma in children. Having a mold allergy is kind of like a double-edged sword. Yes, it causes a whole host of health problems, but it also makes a person more aware of its presence and can therefore quickly spot when it’s becoming a serious problem. The U.S. Department of Health states that indoor mold produces potent toxins that not only can be absorbed by the lungs, but also the skin and intestines. The long-term effects of mold exposure can have serious effects on your health including cancer, neurotoxicity, memory loss, cardiac conditions and more. Why Does it Become Such a Problem? The reason why mold becomes such a big problem so fast is because it reproduces by forming millions of spores. These microscopic mold spores cannot be seen by the naked eye. And, what’s worse is that these spores are able to survive under conditions that visible mold cannot. What this boils down to is that you may not see any physical evidence of mold in your home, but the spores are still present and have the potential of causing severe health problems and/or landing on a surface that is inhabitable that allows it to start growing again. 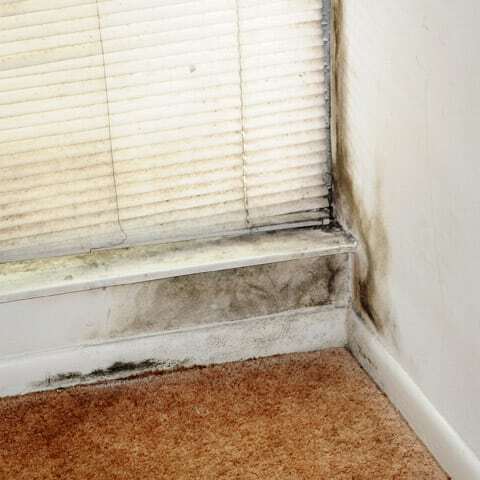 Another disturbing factor is that many types of mold form outside and can easily enter your home through open doors, windows and vents or hitchhike their way in on your clothing. For these reasons, we highly suggest that you use an air purifier to control mold problems. This simple device is able to remove all kinds of mold spores and is crucial to helping you live a healthy life. 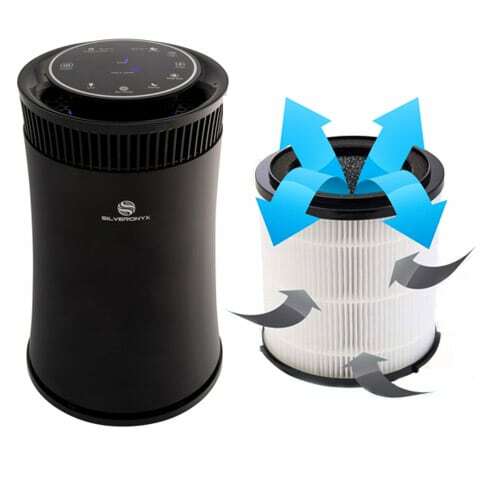 Now that you know the severity of the issue regarding mold, you may be wondering how do you find the best home air purifier for handling such an important task? When looking for an air purifier for mold removal there are three key features you want to keep in mind. Getting a device that has all of the options listed below will ensure that your home stays free of harmful mold spores. The first thing you want to make sure the room air purifier has is a True HEPA filter. This filter is essential because it is certified to capture particles as small as .3 microns. This includes all types of mold spores that make their way into your home. Getting a device that doesn’t have the True HEPA stamp doesn’t give you any guarantee that it will help with the problem. Stay away from air purifiers that say “HEPA-like” or “HEPA-type” as they are inferior to a True HEPA device. An Ultra Violet (UV) light is also crucial because it actually kills mold spores. It works by using a beam of light to zap the spores and destroy their DNA makeup. The UV light is located inside the air purifier and no light is released into the room. It’s a great backup system for the True HEPA filter because it kills the particles that it cannot trap. This filter is also a must have because it picks up where the other two types leave off – it eliminates mold odor. Activated carbon is excellent at absorbing toxic Volatile Organic Compounds and Microbial Volatile Organic Compounds that mold emits. Without this feature the smell of mold will still exist. Buying an air cleaner that has a combination of these three features is your golden ticket to having a mold-free and odor-free home. Below, you’ll find the two best products that fit these criteria and continue to top the charts for mold removal. If you want the best air purifier for mold at the most affordable price, this is it. This product takes care of all aspects of mold spores using the three essential filters we mentioned above: a True HEPA filter, UV Light, and Activated Carbon filter. It also boasts a negative ion generator to help eliminate other kinds of harmful particles including pollen, pet dander, smoke, and dust. What you’ll love most about this product is that the True HEPA filter is shaped like a cylinder. This increases the surface area by 60% compared to flat filters and is much more efficient. Another highlight is that it can cover a very large space up to 500 square feet, making it a perfect choice for any room of the home, including the basement. 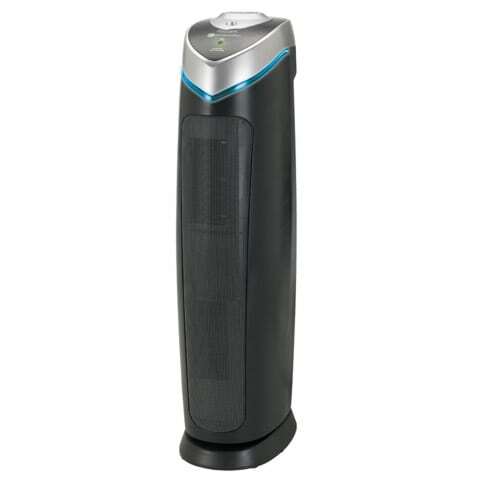 This product is your second best bet for a powerful mold air purifier and is not very expensive. It also includes the three essential filters mentioned above but the True HEPA filter is not cylindrical like our #1 recommendation. That doesn’t matter though because this air cleaner is made for small to medium sized rooms up to 200 square feet. A standard flat filter is perfectly fine for that size space. The vertical shape is a nice design to have since it allows you to place the air purifier practically anywhere. This device is also quite stylish compared to many other air purifiers on the market and looks great with any decor. While you most likely came to this page because you were looking for an air purifier to get rid of a mold problem, there are some additional advantages you’ll enjoy by owning one of these devices. As we noted above, the True HEPA filter captures the tiniest particles possible from the air. Not only does this mean that you’ll trap mold spores, but it will also help to get rid of other airborne particulates that cause health and/or breathing problems. This includes things like dust, pollen and common allergens. The UV light will also take care of airborne viruses and bacteria that may be present inside home or area you place the air purifier in. This will help sterilize the environment and keep it free from toxins that tend to make a person sick. 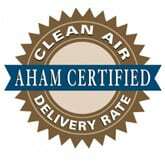 An added advantage of the Activated Carbon Filter is that it too eliminates more than just the odor produced by mold. As air is sucked in and passes through this filter, it will trap particulates that are the root cause of other smells inside your home. Common odors you’ll find reduced by the devices listed above include those from pets, cleaning supplies, cooking and some types of smoke. Often, once a person realizes that these mold air purifiers are also capable of tackling other indoor air quality issues, they move the device into a more centralized location or specific room that is in need of purification after the mold problem is taken care of. As with all air purification devices, the end goal is to produce a clean, fresh environment that’s healthy for you to breathe. Yes, mold is a common problem in many homes, but so are these other things mentioned above too. Being able to purify the air from other contaminants is an added benefit you’ll get from these products.